Hello, hi, how are you today? Dark pink card stock cut at a warped angle, light pink card stock has been embossed. 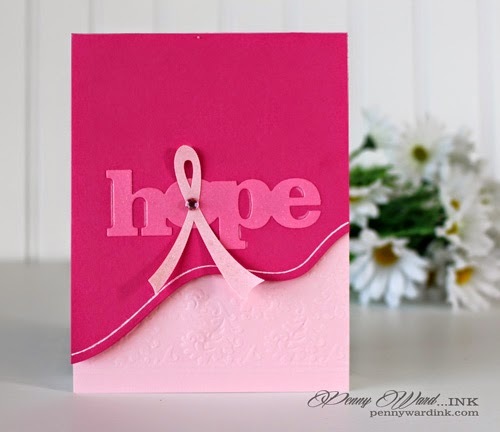 Die cut "Hope" and a pink ribbon cut with Silhouette Cameo. Add a little shine to the ribbon and finished with a faux jewel. This is gorgeous. What a fabulous encouragement card. Love all the pinks, and that wavy border you created. Wow - what a beautiful, hopeful card!! Love that fun wavy edge and just adore all the pinkness!! You are very good at creating cards that inspire feelings of can - do - it ness and hope!! Good for you, you hope spreader, you!!!! Hope you have a day filled with beauty!! !